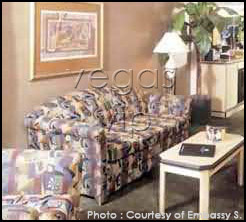 Standard room amenities : Satellite TV, AC, microwave, oven, refrigerator, in room nternet access, telephone with voice mail. 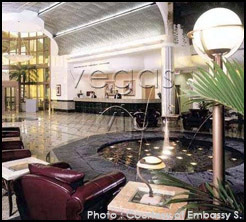 Hotel amenities : Dry cleaning, car rental desk, parking, all suites, laundry, maid service. 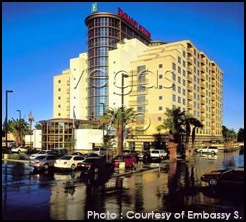 The Embassy Suites is located just one mile from McCarran International Airport and 1.5 miles from the Las Vegas Strip. These two-room suites are well appointed with modern conveniences including complimentary cooked-to-order breakfast, a fitness facility, a lounge with an open bar from 5 to 7 p.m. and a pool.